We now offer LED Low Voltage Landscape Lighting, and there are many reasons to light up your yard at night. 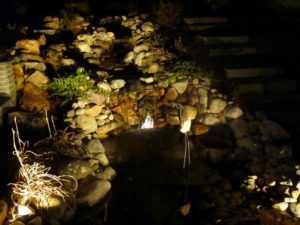 The one I like the best is that it makes your yard much more enjoyable after dark, you can highlight the views that you like while the darkness hides the views that you don’t want to see. 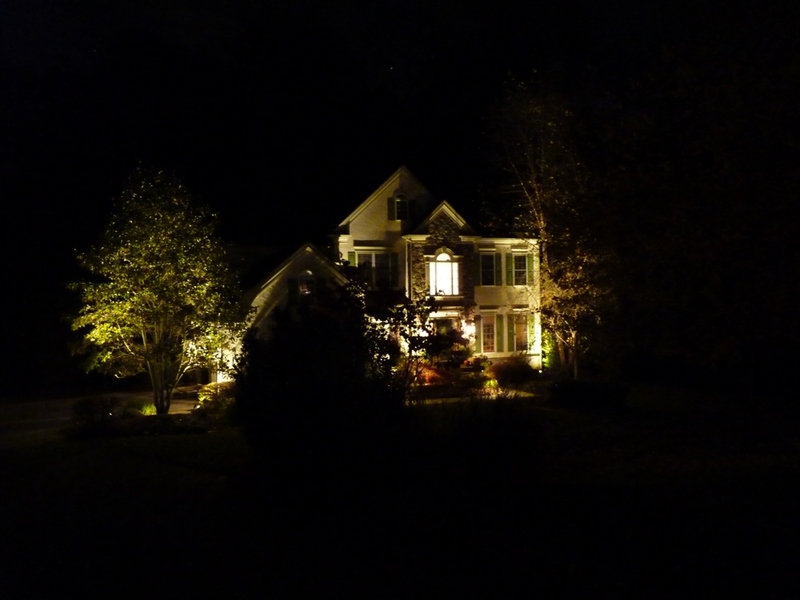 High on many people’s list of importance for night lighting is Safety and Security. A yard that is lit up at night will also discourage intruders. Lights can make steps and walks easier for you, your family, and welcome visitors to navigate. A walk doesn’t have to look like an airport runway – small ‘Bullet’ spotlights can reflect light off of buildings and other objects, this can often be brighter and less noticeable than the path lights that are so common, and often misused. 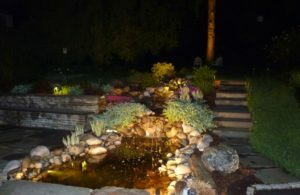 Without lights, you would not be able to see or appreciate this at night, and there would be no sense of space in your yard. 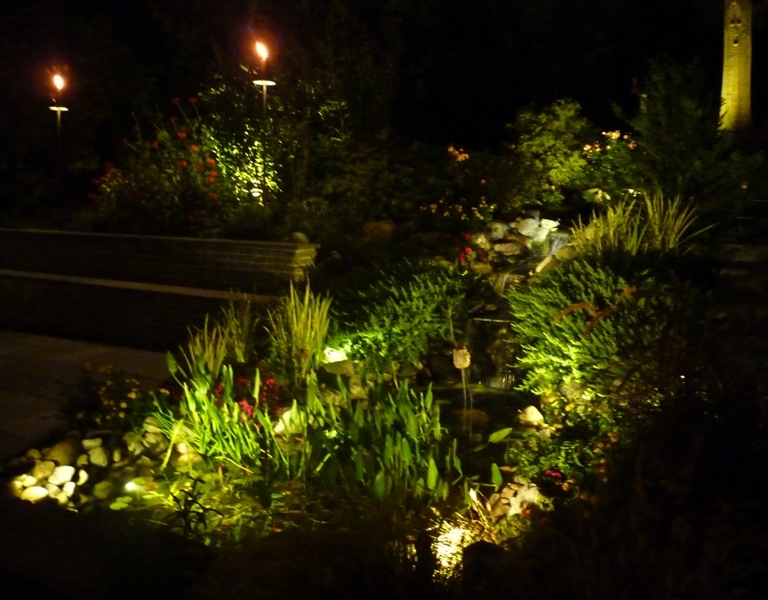 Now designing and installing LED low voltage landscape lighting to highlight plantings and architectural features of your home. I have taken many seminars from Cast Lighting, Unique Lighting, and FXLuminaire lighting, including three in 2016, and two already in 2017 to keep up with the latest information. We can set up a free, no obligation, demonstration so you can see exactly what we can do for your property and house. 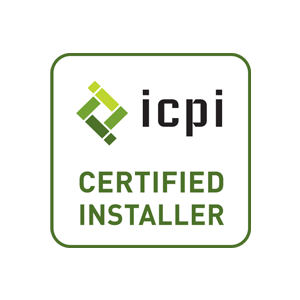 Systems starting at $2,000, and retrofits from existing systems to LED lights for less. 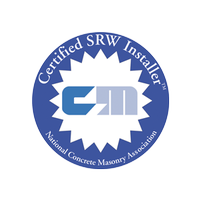 Improve The Curb Appeal Of Your Home all year long! 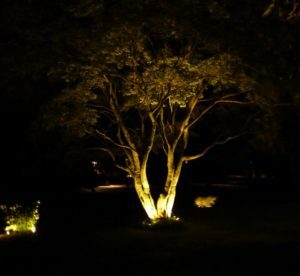 Light up Your Trees and other plants for spectacular nighttime effects, by highlighting the nicest features of your landscape while the less interesting features are not seen. – Your property can look better at night than during the day. Light up your Entrances, Steps, Walkways, Patios, and other Outdoor Areas for Evening & Nighttime Entertaining or just relaxing with the family. Increased Safety by lighting your walks and steps. 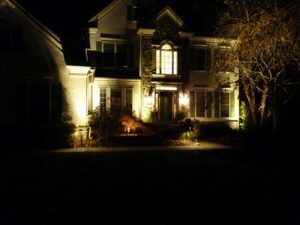 A house with lights can also discourage intruders that don’t want to be seen approaching your home. New LED lights can light up your property for less electricity than a couple of 100 Watt light bulbs, and will usually last for over a decade, There is little maintenance needed, unlike the halogen lights commonly used just 5 years ago. Existing Halogen systems can be retrofitted with LED lights, so old systems with many burnt out Halogen lights can be brought back to life with extra long-lasting and energy efficient LED lights. With new technology transformers you can have much more control of when lights turn on and turn off, plus control individual lights from your smartphone including dimming and even the color of the light. Front Entrance and Walks with Low Voltage LED Lights seen from down the driveway. 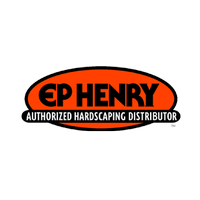 – Newtown Square, Delaware County, PA 19073. 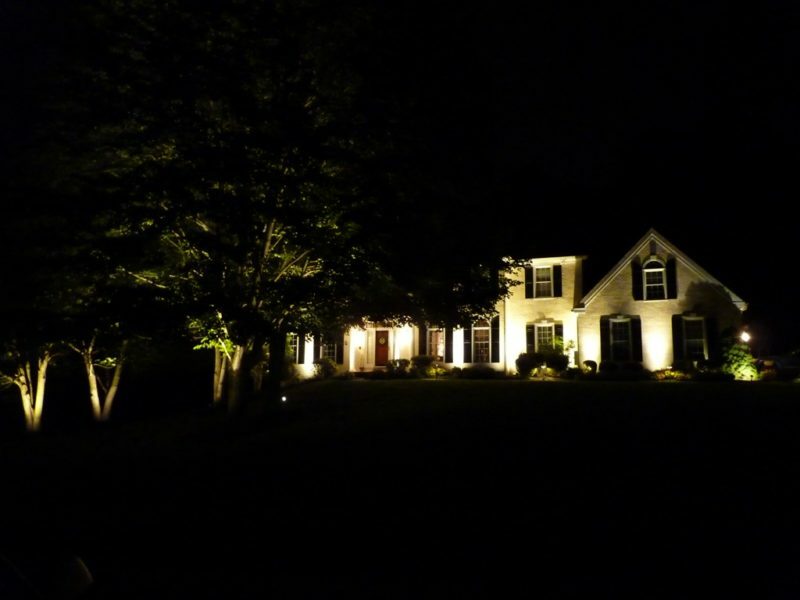 Without Landscape Lighting the only light would be the light coming from inside the house, or from harsh spot lights that are commonly used. 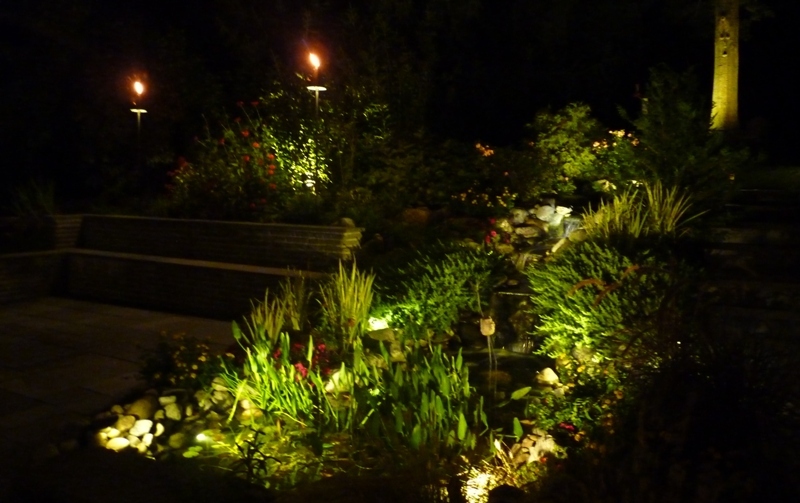 LED Landscape Lighting complements the House and Landscaping give more light and a softer light, while they use much less electricity. As seen below from the street, the house looks inviting to friends and visitors, while still discouraging intruders that would probably be more attracted to a house where they could not be seen from the street, adding to your safety and security. Steps on right side lit for safety at night, and patio and sitting wall on the left is lit mostly by reflected light. Back Yard Pond lit up with Low voltage LED Lights while other lesser features are still in the dark. The photo at the top of the page was taken in late Summer. The photos below were taken in Spring and winter that show different effects at different times of the year. Late Summer with TiKi Torches for a party. Shown here are effects you can get by uplighting trees. The Upright Japanese Maple has 3 uplights that create shadows and helps give the tree more definition at night. 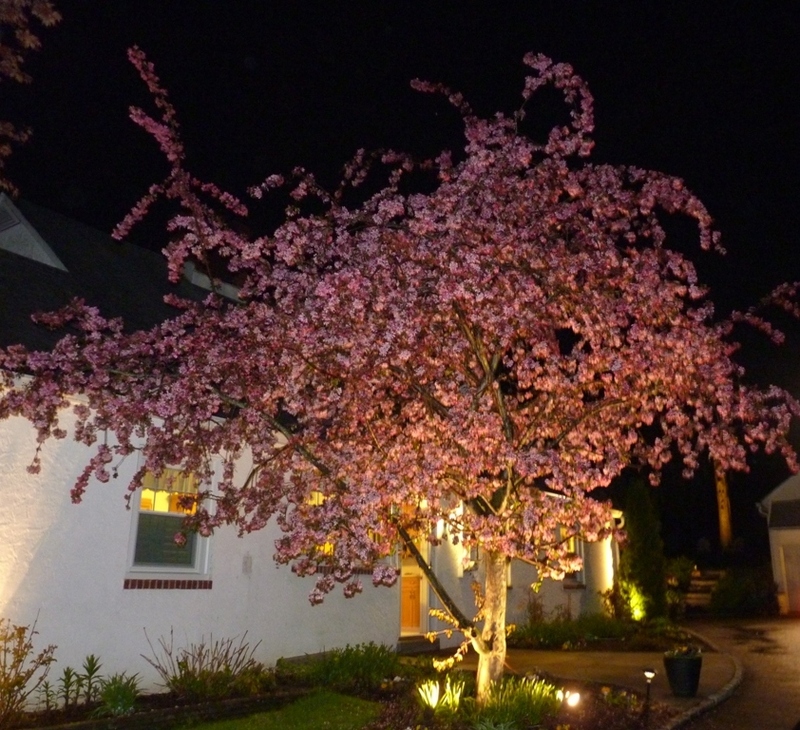 The Crab apple only need 2 uplights which also creates shadows and definition. Usually you need at least 2 lights on trees to get the best effects. Japanese Maple Tree at night. 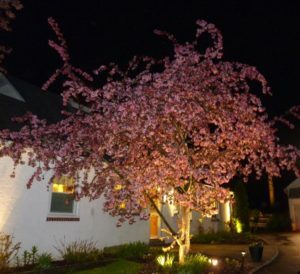 Crab Apple Tree in bloom at night. Front Entrance, Walks and trees with Low Voltage LED Lights seen from down the driveway. – Media, Delaware County, PA 19073. 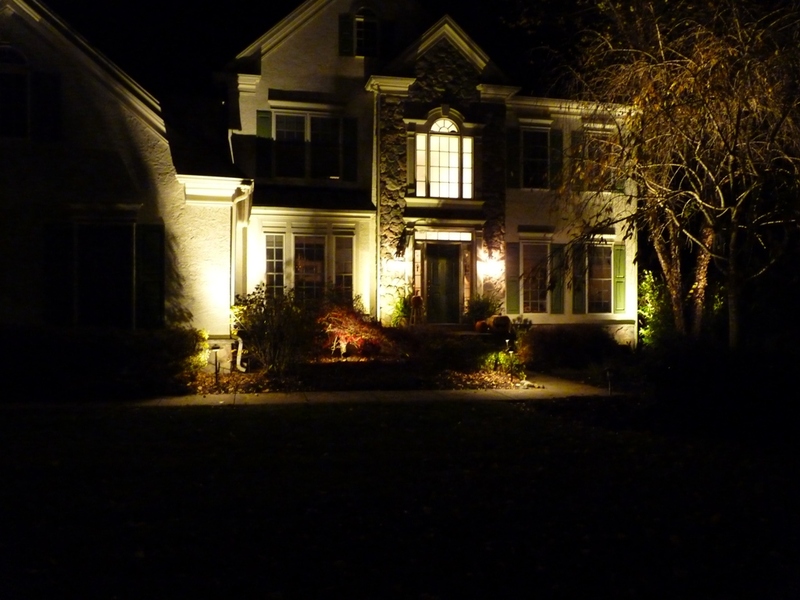 Another example of a front entrance showing the benefits of low Voltage lighting. Safety, Security and soft lighting that adds to the curb appeal of the property. 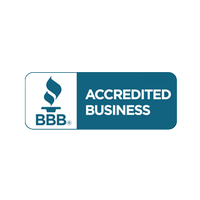 Plus benefits you don’t see – the electric costs are much lower that harsher spot lights. New LED lights can light up your property for less electricity than a couple of 100 Watt light bulbs, and the bulbs will usually last for over a decade, unlike the halogen lights commonly used just 5 years ago. Existing Halogen systems can be retrofitted with LED bulbs, so old systems with many burnt out Halogen bulbs can be brought back to life with extra long lasting and energy efficient LED lights. There is more information on this at the FXLuminaire website www.fxl.com , and as well as most other low voltage lighting companies. You can find even more technical information on Low Voltage lights: such as energy consumption and energy savings, durability, color rendering, and an explanation of what a LED light is (probably more than most of you would care to know), plus photos of different types of fixtures at the Unique Lighting systems web site: http://www.uniquelighting.com Click on LEDs in the top right corner of any page on the site. With new technology transformers you can have much more control of when lights turn on and turn off, plus control individual lights from your smart phone including dimming and even the color of the light.This is probably more than most of you would want to do, but is available for someone who would like complete control of the lights. You can get more information on this at the FXLuminaire website on their Luxor ZDC Transformer page: http://www.fxl.com/luxor-zdc There are some videos on their website showing what their lights can do, and they really can do what I think are incredible things that the videos show. 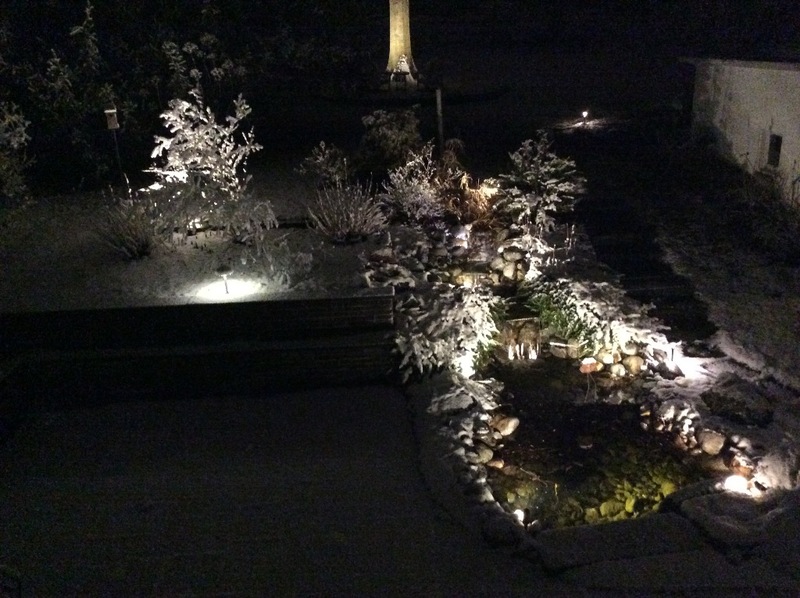 I myself would not need these lights but they have amazing effects that might be great to set off your special property, commercial business or restaurant.